[prMac.com] Berlin, Germany - Unlike other offerings, OCRKit performs all image processing including the OCR directly on your iPhone. No image data is transferred to servers over the air, your data plan is saved and OCRKit just works while abroad. OCRKit is developed with the main focus on usability and simple to use. By taking a picture of a document, letter, contract, poster, note or business card it recognizes the text and shows it on the screen. Ready for processing, which allows you to further edit and work with the text. Copy and paste it to another apps and exchange it with friends and colleagues. It helps you to easily bring graphical information fast and into a textual form on your iPhone. 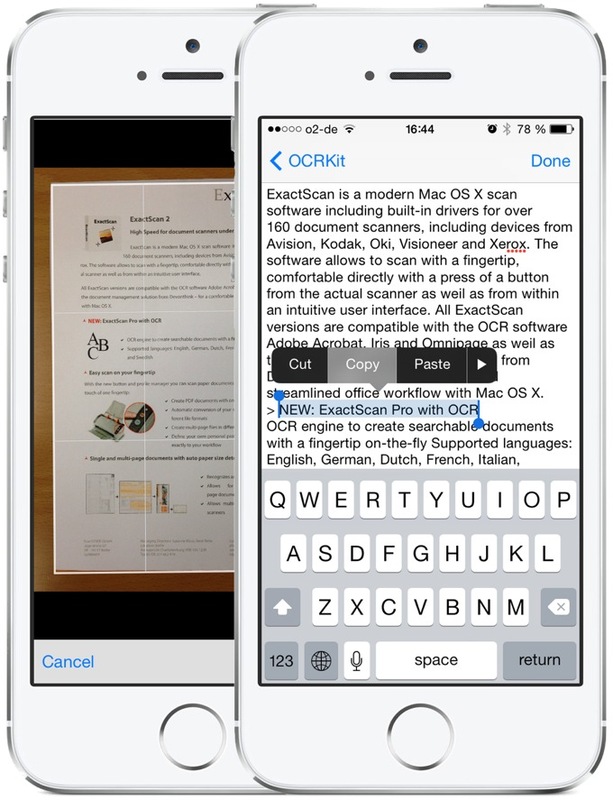 The OCR requires a sharp image with macro focus, and thus works best with the iPhone 3GS and iPhone 4. The 5 mega-pixel camera of the iPhone 4 and OCRKit can potentially replace an entry-level portable scanner for working with paper documents abroad. OCRKKit comes with support for different OCR languages, including: English, Dutch, French, German, Italian, Portuguese and Spanish. OCRKit Mobile 1.0 is only $4.99 (USD) or EUR 3.99 and available worldwide exclusively through the Apple iTunes Store in the Productivity category. Promotion codes are available for qualified reviewers. Please contact us for free promotion codes, and specify which website or blog you are working for.